Hvar, Vis, Korčula... Those who had the opportunity to take a trip off the coast of Dalmatia will recall sunny beaches, crystal clear waters, and breathtaking landscapes. However, for a few months the names of the Croatian islands have been – less commonly – associated with mobilisation and political turmoil. Instead of being a passive tourist destination, visited by millions of people every year, Croatia's archipelago now intends to become active protagonist of its future. The long spring of the Croatian coast has begun at the end of 2015, when a group of women coming from there founded Pokret Otoka ("the Movement of the Islands"), but it has undergone a remarkable acceleration at the last local elections, between late May and early June 2017. Finally, just a week ago, a series of anti-government demonstrations, caused by the reform of the "Law on Concessions" and headed by this movement, took place in a dozen coastal cities, reaching then the Parliament in Zagreb. To understand what is happening on the Croatian islands, we need to start from their present condition. In a country where tourism accounts for almost a fifth of GDP and revolves around the coast and the summer, the thousands of Dalmatian islands are regarded first of all as tourist destinations, and they are generally less populated and less connected to the mainland off-season. Administratively speaking, they depend on the centres on the coast, from Rijeka to Dubrovnik, including Senj, Zara, Šibenik, and Split. Their long-term development, planned in this case in Zagreb, is inevitably shaped by the interests of the hotel, catering, and services sectors, that live off the flow of visitors. The concerns and daily issues faced by the islanders are at the origin of Pokret Otoka, a movement that seeks to imagine and plan a sustainable future for the islands, in order to combine the vital role of tourism with the protection of the environment and greater sensitivity to the needs of those who actually live on these beautiful lands. Ecotourism, sustainable agriculture, good waste management, and balancing mass tourism and natural resources are some of the priorities of the Movement of the Islands, which denounces "the unbalanced system that today characterises the islands", in Antonia Banović's words, a graduate in Literature and International Relations and one of Pokret Otoka's activists. "The problems faced by the Croatian islands are similar to those of other European archipelagos", adds Banović, who saw her movement "internationalise" in a few months. Invited several times to Brussels and Strasbourg (thanks to the work of some MEPs including the Croatian Davor Škrlec), Pokret Otoka is now in contact with "Dafni", the "Greek Sustainable Islands Network", and other similar European groups. On March 28, the multilateral talks led to the signing of the Smart Islands Declaration , which lays out in 10 points the issues raised by Pokret Otoka in Croatia. While islanders across Europe are gradually joining forces, Pokret Otoka has already taken action against some privatisations (or, to be precise, "concessions") of public spaces on the islands. 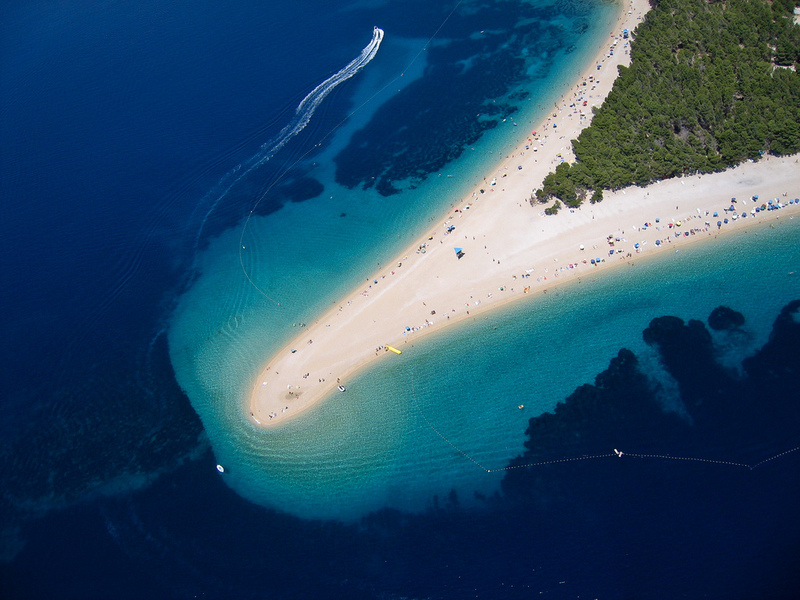 The first case involved Zlatni Rat ("Golden Horn"), the famous beach in Bol, on the island of Brač. In mid-April, the Split county decided to entrust the management of the space for a period of 15 years to "Sport B", a shadowy company based in Zagreb, running a deficit in the budget and having not even one employee. The protests by the inhabitants of Bol – where a municipal company has taken care of the beach for 12 years – forced Prime Minister Andrej Plenković to intervene personally and order an investigation into the decision of the Split authorities, to verify whether there had been irregularities in the assignment procedure. "The inspection proved that three laws had been violated: on maritime goods, on concessions, and on public procurement", says Josip Bačić of the Initiative "For Zlatni Rat". After the government's intervention, the concession was cancelled. Waiting for a new call, the municipal company obtained the management of the beach for another year. But it did not go so well in other cases. "The mayor of Novaglia, on the island of Pago, had to sue the Lika and Segna county for the concession of the Zrće beach", continues Bačić. Zrće, also known as the Croatian Ibiza, has ended up for the next two decades in the hands of the security company of Josip Klemm, a war veteran close to the far right. In such a delicate environment, where the most famous spots of the Dalmatian archipelago are coveted by the most disparate brands of entrepreneurs, the reform of the "Law on Concessions" immediately attracted the attention of Pokret Otoka activists. "The legislation in question – explains Maja Jurišić – covers all public spaces except for forests, that are considered as a strategic area". The main criticism targets the government's plan to "approve the amendments without going through public consultation as prescribed by the law". On Sunday, June 18, hundreds of people took to the streets in a dozen islands to demand a public debate on the law, as was the case in 2015, before a political crisis led to the end of the Orešković government and the abandonment of the text (subsequently modified again by the Parliament). Many elements in the legislation concern the islanders, since "the concession mandate, once assigned by a county authority, can be used by the private party as a guarantee to get a loan at a bank", says Maja Jurišić. This way, "commons are likely to end up in the hands of a bank in case of insolvency", warns Jurišić, who is also concerned by the return to power of the Croatian People's Party (HNS). "They were the ones, in 2015, to launch the oil exploration project in the Adriatic, then cancelled", the young activist reminds. If the new legislation were passed, in short, the awarding of concessions for a couple of decades could become a de facto property transfer. This is the concern of David Kabalin, who founded the movement "Protect the Beaches of Rab". "The truth is, beaches are all is left to privatise in Croatia", says Kabalin. And in a country where beaches make up for nearly 20 percent of GDP, the battle for their management will be a long one. As of now, Pokret Otoka announced a signature campaign.